This is an exceptionally versatile salsa: its intensely vibrant colour and flavour goes well with all grilled meats, especially grilled sausages, as well as cold meats. 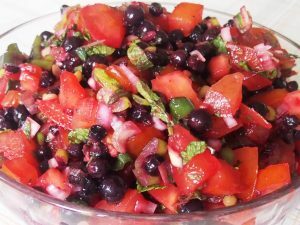 From smoked salmon to roasted turkey cuts, this blackcurrant & tomato salsa is delightful! It’s a great way to invigorate the flavour of tomatoes. And it makes a superb vegetarian salad that can be enjoyed with a light chilled off-dry red or rose or a crisp white wine. 1.Put Blackcurrants in pan with sugar and vinegar, Stir over low-medium heat until blackcurrant juices start to run, sugar dissolved and blackcurrants coated in a richly purple-red sweet-sour juice (about 4 minutes: don’t let it catch: slower better than hotter). 2.Take off heat and let cool. Mix all ingredients except half the shredded mint: add salt and pepper to taste. 3.Set aside for an hour before serving. 4.Sprinkle with remainder of shredded mint for serving.